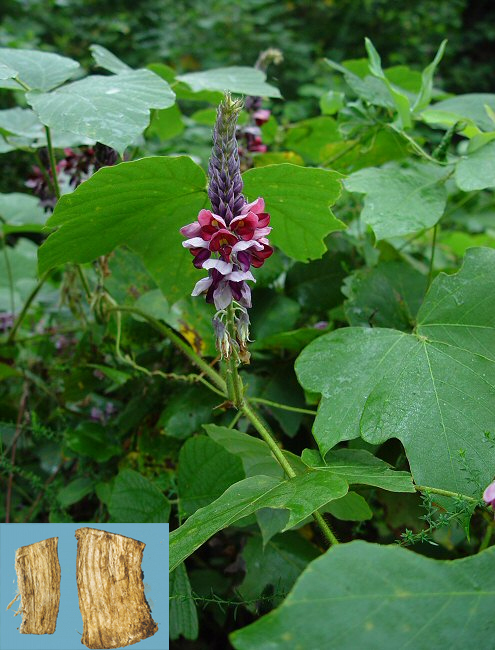 Common Name: Pueraria root, Kudzu vine root. Part Used & Method for Pharmaceutical Preparations: The roots are dug in spring or autumn. They are cut into slices and dried in the shade, or the slices are baked. Properties & Taste: Pungent, sweet and cool. Functions: 1. To release the exterior; 2. To bring measles rash to the surface; 3. To cause yang to ascend so as to alleviate diarrhea; 4. To clear heat and promote production of body fluids. 1. Exterior syndrome due to invasion by exogenous wind and cold manifested as stiffness of upper back or neck, absence of sweating, aversion to wind, fever and headache. Pueraria root (Gegen) is used with Ephedra (Mahuang), Cinnamon twigs (Guizhi) and White peony root (Baishao) in the formula Gegen Tang. 2. Exterior syndrome due to invasion by exogenous wind and heat manifested as headache, fever, painful eyes and dry throat. Pueraria root (Gegen) is used with Bupleurum root (Chaihu) and Scutellaria root (Huangqin) in the formula Chai Ge Jieji Tang. 3. Damp-heat dysentery. Pueraria root (Gegen) is used with Coptis root (Huanglian) and Scutellaria root (Huangqin) in the formula Gegen Huangqin Huanglian Tang. 4. Early stage of measles with incomplete expression of the rash, fever and chills. Pueraria root (Gegen) is used with Cimicifuga rhizome (Shengma) in the formula Shengma Gegen Tang. 5. Diarrhea due to deficient spleen. Pueraria root (Gegen) is used with Pilose asiabell root (Dangshen), White atractylodes (Baizhu) and Costus root (Muxiang) in the formula Qiwei Baishu San. 6. Thirst in febrile diseases or diabetes. Pueraria root (Gegen) is used with Ophiopogon root (Maidong), Trichosanthes root (Tianhuafen) and Fresh rehmannia root (Shengdihuang). Dosage: 10-20 g, decocted in water for an oral dose, or prepared into powder. For diarrhea, it is roasted in hot ashes. Cautions & Contraindications: To treat diarrhea, the herb is first baked.